For those of you craving some excitement for Summer nights, here's a colorful and dramatic smoky eye which is actually pretty easy to create. To tone it down for day, just keep the shadow within the socket area instead of blending it out and up as far as I did. And yes, these swatches above look NOTHING like how they appear on my lids, but that's why it's so fun working with duochromes and a black base! Step 1: First apply black kajal or paint very thickly all over the lids, up to the socket line. Step 2: Using a synthetic concealer brush (or any synthetic paint brush), softly smoke out the edges so there are no hard lines, and bring the color up and out. Step 3: Apply the kajal to the lower lash line and water line as well, and smudge out lightly. 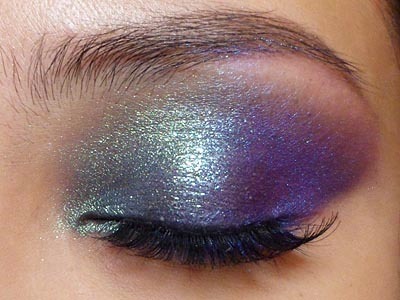 The finished look should now be like the above image, which is a typical winged smoky eye shape. Step 4: From here, we move on to the fun stuff. Lightly dust the translucent green highlight all the way from lower lash line up to the brow, but ONLY ON THE INNER HALVES of the lids. Step 5: The shade that's going to make everything look holographic is the pink/violet/blue duochrome on the outer half of the eyes, top and bottom. When you pack it over the black, you will no longer see the pink, but the violet and blue is going to take on a sort of glow which is going to stand apart from the green and give the most interesting effect. Step 6: This step is optional. I wet a flat brush with a little liner sealant (Ben Nye Liquiset), dabbed it into some aqua green translucent glitter, then pressed it right down the center of the lids. 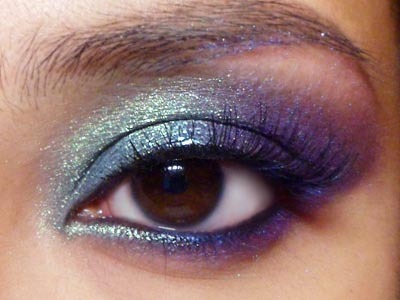 This echoes the green shadow, but adds a "wet" effect and gorgeous sparkle when you blink. Step 7: To finish the look, I curled my lashes and then applied a strip of wispy lashes. Any type of lashes would work, including plain black mascara. Aww wow, this look is stunning! ♥ The duochrome effect is adorable, love it!! Thanks Constanze! Was just looking for something a little different to do and decided to pull out some of the pigments I just never seem to use! Such a gorgeous and ethereal look! Love it!